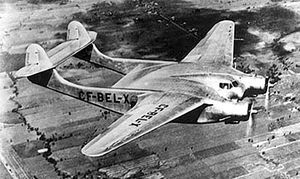 The Burnelli CBY-3 Loadmaster is an unconventional transport aircraft that was designed by American engineer Vincent Burnelli and built in Canada in 1944 by Canadian Car and Foundry. The CBY-3 "lifting fuselage" was an evolution of the earlier Burnelli UB-14. Burnelli worked as a designer at Canadian Car and Foundry (CanCar) in Montreal, and the CBY-3 was intended for bush operations in northern Canada. The sole prototype was extensively tested but failed to gain a production contract. Originally registered CF-BEL-X while still in the experimental stage, this one-off, twin-boom, aerofoil-section fuselage, high-lift airlinergarnered significant interest from the industry. CF-BEL-X underwent rigorous testing and proving flights designed to show off its potential. Despite a trouble-free test program and glowing accolades from the press and industry observers, no production orders resulted and the prototype was later sold in the United States as N17N. Moving to Southampton, New York, Burnelli continued to promote his airfoil-shaped fuselage transport aircraft. In 1955, he adapted the CBY-3 to carry an expedition of 20 passengers and 41 sled dogs, along with their equipment, to the North Pole, but the enterprise was canceled. The Loadmaster continued to fly regularly as a commercial airliner both in northern Canada and South America; acquired with design rights by Airlifts Inc. in Miami, Florida, it went to Venezuela, and returned to Burnelli Avionics for refitting with Wright R-2600 engines, finally ended its flying days at Baltimore's airport in Maryland. 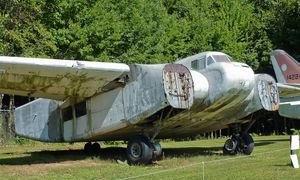 In 1964, the CBY-3 air transport was retired to the New England Air Museum in Windsor Locks, Connecticut, where it was displayed outside. 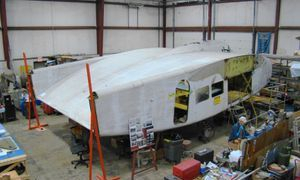 As of January 2015, the aircraft had been moved into the museum's restoration hangar and was being worked by a team of volunteers.